San Francisco (THEWILL) - THEWILL has gathered from multiple knowledgeable sources that ailing President Umaru Musa Yar'Adua, 58, has had an embolic stroke. An embolic stroke is a kind of stroke that occurs when blood cloth occurs in the heart, travels to the brain and restricts blood flow, which explains why the president can no longer talk, move his hands or body. We can also authoritatively say that the president was actually evacuated on a stretcher in a coma from the clinic in Abuja to Jeddah in clear contrast to the images from News Agency of Nigeria (NAN) showing the president boarding the presidential plane on November 23, 2009. On arrival in Jeddah, the President was immediately taken into the intensive care unit of the King Faisal Specialist Hospital and Research Center where he has been on dialysis and intensive care. The Nigerian president has been suffering from multiple complications as a result of Churg Strauss Syndrome, a multi systemic disease. The complications he has suffered include acute pericarditis, which is an inflammation of the membrane covering the heart, hypo pigmentation (skin discolouration), a loss of collagen due to excessive steroids which the president has been pumped with over the past months to keep him going, kidney and uranium failure, and most recently the stroke which has shut down almost all his entire senses. 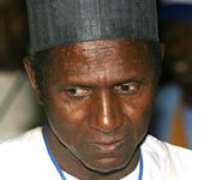 A source also said that President Yar'Adua has not been able to communicate with anyone. “No one has had access to him lately except his wife, daughters, and medical staff. Information on the President's health has been tough,” one of them stressed. There have been attempts to keep Umaru Yar'Adua's current state of health shielded from the public for political reasons. The president did not inform the National Assembly of his ill health based on advice from senator Abba Aji and wife, Turai. It is no longer a secret that the Nigerian President before his recent hospitalization only worked for about 5-7 hours daily on weekdays leaving Turai to deal with other matters. The kitchen cabinet made up of Sayyadi Abba Ruma, who is Minister for Agriculture, Tanimu Yakubu, President's Chief Economic Advisor, Bukola Saraki, Kwara State Governor, Yayale Ahmed, Secretary to the Government, and James Ibori have not been able to see the president since his admission to date. The recent calls for the president to resign or send a letter to the leadership of the National Assembly has put the group under pressure. There is a big disagreement amongst the members on the way forward. The northern establishment and some former heads of state met last week, sending word to the president's camp to formally notify the leadership of the National Assembly of his hospitalization thus enabling his deputy assume power. The recently confirmed Chief Justice of the Federation Justice Aloysius Katsina-Alu has warned that he would not allow the Vice President swear him in except he is constitutionally empowered to do so. The first lady is vehement on buying more time for the president praying for a miracle. An attempt was made last week to get Vice President Goodluck Jonathan to act for the president without recourse to sending a letter to the National Assembly but the move was shut down by the Vice President. VP Jonathan has stopped holding late night meetings so as not to send a signal that he is scheming to force a resignation from the president. The Villa practically shuts down at 6.pm one source said. The Peoples Democratic Party and the Presidency seem to have come to terms that getting a letter to the National Assembly is inevitable now. The letter will be written by Mr. David Edevbie, the President's Principal Secretary who will then deliver it to the president or his wife, the legislators will get it before Wednesday, December 30, 2011, another source said. In a related developement, the chairman of the Nigerian Medical Association Delta State Branch, Dr Akpufuoma Pemu has decried the situation where liliputian politicians claim to have spoken or heard from the president in order to seek cheap popularity and political relevance. “In order to stem this misinformation and distortion of medical facts, I enjoin the wife of our president and members of his immediate family to give the nation the true picture of our number one citizen's health. This will help to dispel the speculation that our president is gravely ill and on life support. It is no shame to be sick as that is part of the price we pay for being mortals. This is also to prevent a situation where those who ordinarily would not win a councillor seat in their constituency parade themselves as "wanna be" national political leaders,” the statement said.